On Thursday, May 5th the Virginia High School League (VHSL) Executive Committee voted and adopted a few changes to the 2016-2017 school year. Concluding the first year of the two year state alignment cycle (2015-2017) the Executive Committee met and voted 27-0 and approved to move the State Wrestling Championships to the Norfolk Scope for Group 4A, 5A and 6A for the 2017 and 2018 years. Over the past 10 years as Fauquier High school has moved from the 3A to 2A and now a 4A state classification, it found themselves traveling to Robinson High School in Fairfax to Oscar Smith High School in Chesapeake, and in most recent years to Salam Civic Center, Salam VA for the State wrestling tournament. VHSL still plans to host the group 1A, 2A and 3A State Wrestling Championships in Salem Civic Center as the 4A high schools will now be moved and aligned with the other 6A and 5A schools for the next two years. The Norfolk Scope was built in 1971 and is located at 201 East Brambleton Avenue Norfolk, Virginia. The current seating capacity is about 11,000 as some have stated thats its an iconic landmark in downtown Norfolk. The building is a shape as a dome and to this day the venue remains the world’s largest reinforced thin-shell concrete dome. 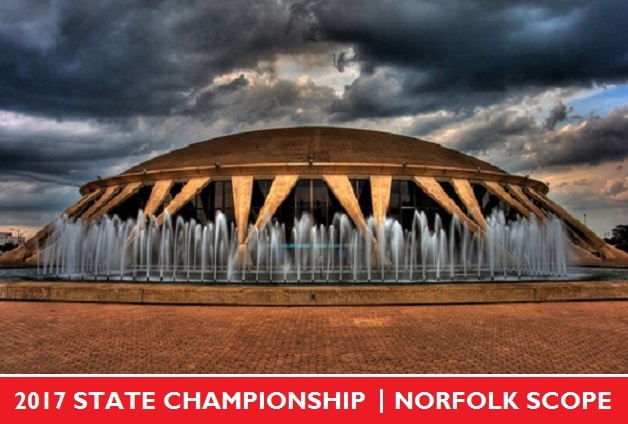 Q: Having coached in many of the state wrestling sites in Virginia – any reflection of this venue change to the Norfolk Scope and be combined with the 6A and 5A schools? Coach Fisher: "I am excited for the move. The Norfolk Scope Arena appears to be a great place to have the VHSL State Wrestling Championships. It is also closer for the Fauquier County Teams. Additionally, we wrestle and have great relationships with many 5A and 6A schools in and out of the season, so it will be fun being at the same State Championship event as the other Virginia teams that we predominantly wrestle. I see it overall as a very positive move for Fauquier Wrestling." The other big VHSL change comes with the expanding of the state wrestling brackets as the 6A and 5A groups look to maybe expand to a 12-person bracket. At this time it is undecided if this expansion will be carried out to all of the other state classifications. Over the past three years the VHSL has used an 8-person bracket system for the state meet, allowing only 4 to advance from each region. This change would allow each Region to advance more individuals to the state meet. Q: Undetermined if the VHSL will run a 12 or 16-person bracket for the 4A group – any reflection with a move to expand the state brackets? Coach Fisher: "I would like to see an expansion of the 4A brackets to 16, but 12 would certainly be better than 8. Way too many times, the region champion has to wrestle the 3rd placer from the region again in the second round of states. Additionally, every year, we have guys who do not get out of the region that would place at the state tournament because of the wrestling strength disparity between our regions. Increasing the numbers to the state tournament will help in mitigating that issue."